* Updating Xojo * by Marc Zeedar If you missed what happend at the Xojo Developers' Conference (XDC) in Las Vegas in March, here's a quick recap of the major news. * Pretty Print Dialog * by Sam Rowlands Mac OS includes some nifty tools that allow you to make a much more elaborate print dialog box. Sam shares the code for how to make that happen. 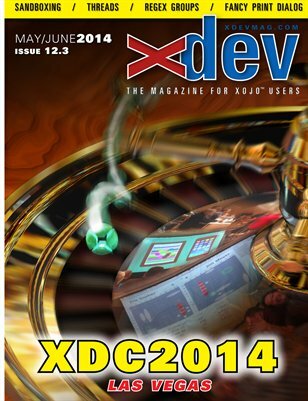 * XDC 2014 * by Marc Zeedar This is a comprehensive report of XDC in Las Vegas in March -- if you didn't get to go, read this epic report to find out what it was like. Marc shares his experiences, as well as key tips from the sessions he attended, along with plenty of photos. * App Sandbox Guide * by Sam Rowlands Apple has instituted security "sandboxing" rules for apps on the Mac App Store, which means your Xojo apps are restricted in what they can do. Here's a guide to get you out of the sand trap. Plus columns on class interfaces, threads, RegEx groups, Xojo developer profiles, database design, and much more!